The State of Connecticut’s plans for Route 9 in Middletown are still being developed, but one matter has been settled. Pedestrian bump-outs will be installed on Main Street from Union Street to Green Street during the 2019 construction season. Below is an artist’s rendering of the construction plans at the intersection of College Street and Main Street. The stated purpose of this project is “to enhance pedestrian safety and reduce vehicular congestion by shortening pedestrian crossing distances along Main Street.” According to CT-Dot, the significant width of Main Street and the presence of on-street parking has led to the current situation with crosswalk distances of 80-96 feet. The significant time required for pedestrians to cross this distance safely means longer delays for vehicles stopped at intersections. A total of 18 bump-outs are proposed that will reduce the pedestrian crossing distances to approximately 55 feet, allowing the “pedestrian phase” of the traffic signals to be shortened and for the vehicle delay at each intersection to be reduced. Also, the elevated bump-outs will improve visibility for both pedestrians and motorists. Apparently, the bump outs will not be installed at the intersection of Main and Washington to allow for a right turn lane to be added to the southbound lane of Main as it approaches Washington near Luce Restaurant. This new right turn lane will reduce back-up at that busy location. 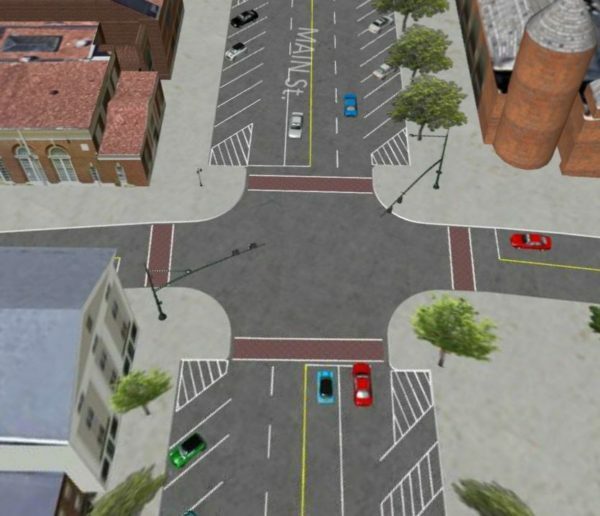 Middletown’s Complete Streets Committee has expressed support for the pedestrian bump-outs, based on the success of similar improvements in other appealing urban settings. Pedestrians report feeling safer and more relaxed in a “walking-friendly” downtown area. Elevated, projecting approaches to crosswalks are aesthetically pleasing, make pedestrians more visible through improved sight lines, add space for plantings and other amenities, reduce illegal parking at corner crosswalks, and reduce vehicle turn speeds by narrowing the roadway.